Join us all day for the launch of the new Origami Center at FIU in DC! The Air Force Office of Scientific Research awarded FIU a $4.8 million grant to launch the Center for Physically Reconfigurable and Deployable Multifunctional Antennas. 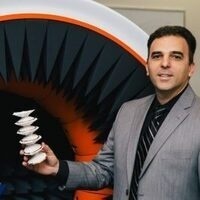 The center will be led and directed by researcher Stavros Georgakopoulos, associate professor in the Department of Electrical and Computer Engineering at FIU’s College of Engineering and Computing and inventor of foldable origami antenna systems.